On Thursday, January 17, at 10 AM the peregrinating Częstochowa Icon boarded a ferry going from Majorca to Ibiza, the next famous island in the Balearic Archipelago. The journey seemed short and nobody expected any problems. At the port the next group of pro lifers were waiting to welcome the Mother of God. However a very strong wind was blowing and the crossing proved difficult. There was a delay of around three hours. There was no time to have a solemn welcome at the port. At 1PM the ferry came to the port on Ibiza. The first vehicle that was allowed to leave the ship was “Life Mobile”. The Mother of God was welcomed by fr. Juan Souza, the Pastor of the parish of the Sacred Cross which is located very close to the port. This is the biggest church on the island of Ibiza. The Icon was carried in a procession to the church and placed at the altar. In the early afternoon individual people could come and adore it. At 3PM. The Sorrowful Decades of the Holy Rosary were said. In the evening at 7.30 PM bishop Vicente Juan Seruga, the metropolitan bishop of Ibiza Diocese presided over the Holy Eucharist in the intention of the protection of the civilisation of life. In his sermon he encouraged the listeners to pledge the Mother of God that they will get actively involved in the defence of life. He stressed that those who make evil legislation directed against human life also challenge God Himself. After the Holy Mass there was an hour of the Most Blessed Sacrament adoration. The ceremony was broadcast life by Radio Maria. At 8.45 PM the next Holy Mass was celebrated to bid farewell to the Icon. 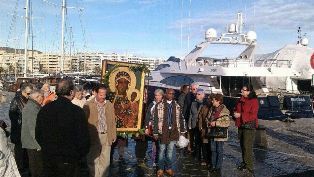 Then the congregation went in a procession to the port along the main streets of Ibiza. The Farewell at the port was very solemn, as the organiser wanted to make up for the lack of a ceremony in the morning. At the very beginning of the procession a pouring rain started but nobody got scared and everybody went to see the Mother of God off to the ferry. After a while the weather improved and during the farewell ceremony at the port it was really gorgous. At 11 PM “Life Mobile” boarded the ship and Our Lady of Częstochowa began Her return journey to the mainland.